This schoolie hit a black Deceiver fly used as a teaser. This keeper hit a pearl-colored Daiwa SP Minnow. Birds were diving, fish were breaking, as massive schools of stripers were feeding on bay anchovies recently. A Kastmaster XL got this fish. Jigs were also working. My youngest son, Jon, turns twenty years old soon. For his birthday my wife and I got him a new surf-fishing outfit which consisted of a 9-foot St Croix Mojo spinning rod along with an Okuma Trio 55 reel. We gave it to him about a week ago as an early gift. While he's caught a number of schoolies with his new outfit, he really broke in the gear at night on October 28 with the biggest striper he has ever landed from shore. 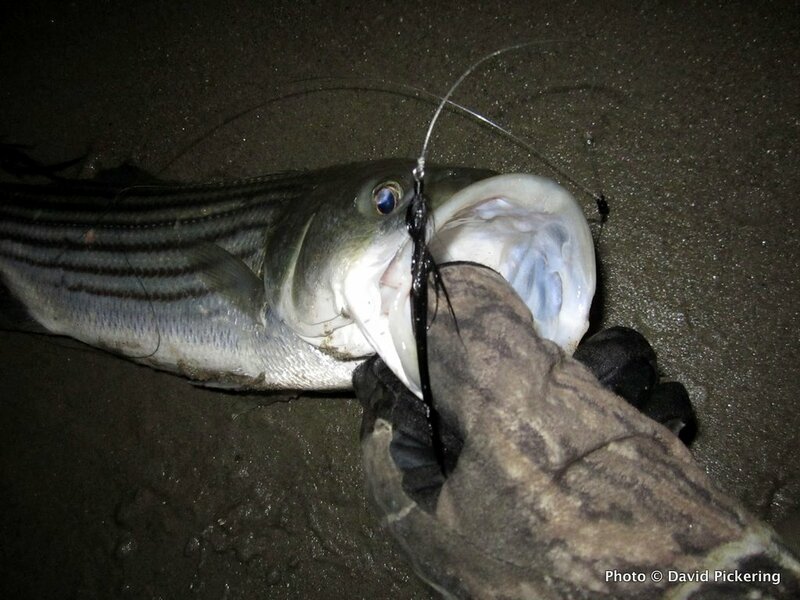 While fishing after dark with a Yozuri swimmer, the kid landed a 45-inch, fat, striper. He did get an accurate measurement and then released the trophy. He had no camera with him to record the event. (I had a camera with me, but I was fishing a spot five miles away from him.) I'm guessing the fish went over 40 pounds, a terrific catch these days. Team Pickering is on a roll recently, as we have scored big numbers of stripers and good numbers of keepers after dark; the after-dark fishing has been far more consistent than the daytime fishing. I've gotten 27 bass while fishing after dark in the past week. A good number of those have been either keepers or near keepers. The biggest has gone over twenty pounds. All of these fish have been taken on the same lures. I am using a swimmer/teaser combination. The hot swimmer has been a Daiwa SP Minnow in a pearl color. The hot teaser has been a homemade all-black Deceiver fly. The teaser is knotted onto my swivel at the top of a leader of about two feet. The swimmer has accounted for most of the larger fish, while the teaser has tended to catch smaller fish. With big numbers of bay anchovies around, the Deceiver teaser is a good choice to use as an additional fish catcher.